The setup I have chosen to use consists of seven segment displays, a relay, op amp, transistor, motor and dominoes. The plan is to get voltage from my partner next to me to flip the relay. I haven't figured out how I will get my voltage to start from his rube goldberg. I was thinking of using a solar panel like the project in front of me who I will have to connect with. From there it will light up the seven segment displays and go into the op amp. I plan on having around 1 volts go into the op amp and around 10 come out by using resistors to get a gain of 10. From the output of the op amp it will be sent to the transistor to power the motor. The motor will be used to spin and hit the first domino to create a domino effect. I will have the dominoes go up and over the desk to fall down to the other side. The person I will be connecting with will be using a solar panel and will have it covered by a sheet of paper. With the dominoes I will be able to pull off the sheet to get his circuit going. In my video it isn't exactly ten seconds because my second set of dominoes are two hours away and I wasn't fully able to get it to the time limit. Once I get my second set of dominoes I will be able to add a longer setup. Update: I am currently working on extending the time of my circuit by adding a timer along with a counter to set off my RB process. I will have the timer be hooked up to the segment displays and once it hits a certain amount of time, it will be transferred to the opamp and relay to start the motor. Nicks circuit did not work out the way he planned and a part failed on Friday. 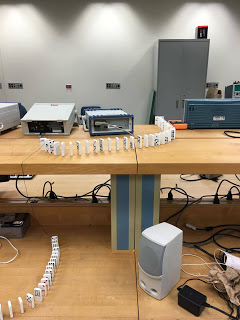 We weren't able to produce a video of our setups connecting but it will be done by using dominoes. Once his motor goes off after his timer is reached his goal time it will cause the dominoes to fall and pull the sheet off my solar panel. Once the sheet is pulled off from my solar panel, my project will start its process. Looking forward to seeing all together. 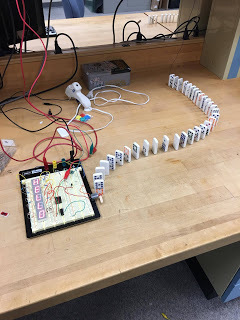 I love the dominoes and how complicated you were able to make the circuitry. Well done, I cannot wait to see it working. I can see the dominoes taking a long time to reset and put together should something go wrong, but it looks like its well worth it, very nice Machine! I do like how you are expanding the time it takes for your Rube Goldberg to run by adding a timer rather than adding more dominoes. I feel like every project that has dominoes, will expand the dominoes set over the rest of the project. Sorry for the late response. I like the idea for the 7-segment displays and in general your circuit element of the setup, however I'm a bit confused about where each of your individual parts start and stop. Also I love that the domino chain goes up to the second level, that was pretty cool!